Halliburton's management had a lot of thought-provoking statements about the state of North America's shale drilling industry and the broader implications it will have on the world of oil & gas. Several years ago, Halliburton's (NYSE:HAL) management team decided to go all-in on North America's unconventional shale drilling movement. So far, it's looking like it was a good bet. The company has built a dominant presence, and shale has proven to be a much more resilient production source than many thought it would be a couple of years ago. Halliburton probably knows more about the shale market than any other company out there. So, whenever the company has a conference call, you should probably listen. On the most recent call, its executives handed out some interesting tidbits of information that should raise a lot of questions for anyone invested in oil & gas today. Here are a few snippets of that call. When you look at them separately, you see thousands of entrepreneurial, smart and motivated risk takers. They readily adapt to the quality of their reservoirs, have almost unlimited access to capital, aggressively applying new technology and quickly mark their business model and structures to meet changing market conditions. And, yes, sometimes even take advantage of US restructuring laws. They are your classic American entrepreneurs, and their success should be recognized. In Silicon Valley, such a success would be greatly celebrated as another industry disruptor. The unconventional disruption is not widely celebrated beyond the energy space, but it should be. The development of US unconventional resources has been as disruptive to the global energy market as Amazon has been to Big Box Retailing or Uber to the taxi business. It unleashed a wave of cheap, reliable energy that has disrupted global geopolitical and energy dynamics; made the US more energy independent; caused OPEC to react; and changed the fundamental economics of offshore production. And I believe it has created hundreds of billions of dollars of economic value, added hundreds of millions of dollars to government tax coffers and provided untold savings for consumers. So unconventional is what I would call a disruptor, so let's celebrate that. It's hard to argue with him about the impact shale has had on the global oil market; just look at the newspaper. The rapid rise in shale production and the subsequent oil price collapse is part of the reason OPEC is trying to lower production quotas from its member states. There is one thing in that statement that sticks out, though, and that is "almost unlimited access to capital." It's true that independent oil & gas producers have benefited immensely from cheap debt and equity investors eager to buy newly issued shares. However, it does highlight one weakness with shale production: A lack of internal funding. That's not a problem when times are good, but the capital markets can be a fickle thing. 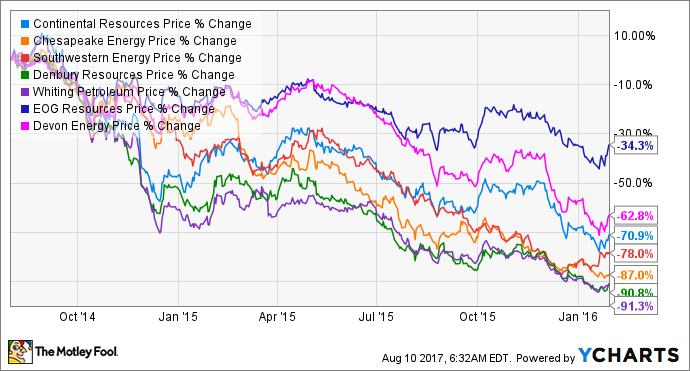 Just look at the stock prices of independent producers from August of 2014 (the pre-crash high) to January 2016 (the bottom). Unlimited access to capital only happens when times are good. When it starts to hit the fan, capital can dry up quick. If producers were held to more conventional standards like free cash flow or return on invested capital, you have to wonder if outside funds would be as accessible. Current CEO Jeff Miller reminded everyone on the call that it has been three years since oil prices and capital investment in the industry as a whole started to decline. While Miller thinks we've hit the bottom of the international market, that doesn't necessarily mean it will be on the rebound soon. First, the lengthy contracting cycles will mute any near-term pricing inflection. Second, our international customers need confidence and commodity prices in order to overcome the duration risk in their project ... And finally, I've been consistently more conservative on the international market. And it's played out exactly how I called it. Today, I expect that there will be improvement and activity over the remainder of the year. But these improvements are not concentrated enough to offset the continued pricing pressure. As a result, the international markets will continue to move sideways. With all of this said, it's important to understand that we are now into the third sequential year of significant under spending in the international markets. This implies that the production decline outside of certain OPEC countries will begin to accelerate, particularly next year as the backlogs of new projects are completed and additional projects are not coming behind. Miller isn't the only one to say as much about the international market. On Schlumberger's (NYSE:SLB) most recent conference call, CEO Paal Kibsgaard also discussed at length how non-OPEC, non-shale production sources have invested in short-term production boosts from existing sources. While it can help maintain production levels today, it increases the depletion rate of a reservoir and ultimately leads to a faster production decline down the road. Kibsgaard believes that if more money isn't invested in global production, we could be headed for a oil price spike. In a little more than a year, U.S. oil production has increased by one million barrels per day. Most companies extracting crude have proudly said their rates of return today are better than they were in 2012 when oil was north of $90 a barrel, and those gains are the result of new techniques and a better understanding of reservoirs. That is true, but it also leaves out the fact that contract rates for oil services ranging from drilling rigs and pressure pumping have been severely depressed. There was so much idle equipment that service companies were taking unprofitable contracts just to help cover costs. As Miller pointed out, this isn't the case anymore. Much of that spare equipment capacity has been put back to work, and it's leading to more lucrative pricing for oil service companies. [T]oday, we believe the current customer demand has outpaced the supply of completions equipment and this should create a runway for a strong utilization through the second half of the year ... As some of you've heard me say before, customer urgency is the foundation for the path to normalized margins. Today, our customers remain urgent. And therefore, we believe our path to normalized margins is achievable. Perhaps this trend back toward normalized margins is best displayed in the frack sand market. Sand consumption evaporated quickly as producers either stopped drilling wells or left them drilled and uncompleted -- not fracked -- to save cash. This led sand suppliers to sell their product at severely depressed rates that didn't even make a profit. For the first time in years, in the second quarter, we experienced our first decline in average sand pumped per well. Let me repeat that because I think this is important. We saw a decline in the average sand pumped per well. And while this is only one data point, it's something we will be watching. We believe current sand price levels have encouraged operators to optimize their completion design using more science as opposed to simply maximizing sand and trade for increased production. Fracking has been an iterative process. At a time when oil was expensive, producers barely had to do anything to make a return. When oil and sand was cheap, they could throw as much sand as they wanted down a hole to juice returns. It's an experiment-as-you-go methodology that harkens back to Lesar's comments on the resourcefulness of producers. This trend could have lots of implications for frack sand producers. The four largest producers are all in the process of adding 11 million tons per year of additional capacity in West & South Texas alone to meet anticipated sand growth. Will drilling activity pick up fast enough to offset those per-well consumption declines? Lesar's and Miller's comments on the oil and gas market raise a lot of questions for investors. At what price do international producers increase spending levels? Can shale's entrepreneurial spirit undercut those price increases and delay a recovery even longer? How much longer until higher prices for services & equipment slow shale's growth? Will Wall Street continue to throw capital to producers as production growth rates slow down and cash returns become a priority again? It's hard to say exactly how all of these things will play out, but they are interesting trends worth watching in the coming quarters.